Step aboard the most luxurious boat in Cabo San Lucas for a whale watching tour extraordinaire. 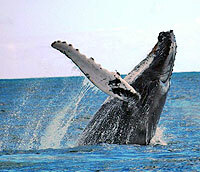 FantaSea will be your host for an afternoon of spotting for the most magnificent of sea creatures - the humpback whale. Fanta Sea's size gives you stability, comfort and also a great vantage point that gives you a good view even in rough seas. Get fantastic photos of Cabo landmarks like Land's End, the Arch, and the Sea Lion Colony, then enjoy snorkeling and kayaking in beautiful Chileno Bay, where coral and tropical fish abound in the clear blue waters. After the activities, a delicious lunch will be served. During our trip, you will enjoy the unlimited, all-you-can-drink International Open Bar, while holding your camera ready to capture the next whale breach on film! Also watch out for dolphins, manta rays, sea turtles and more. With two decks, a front lounge and two bathrooms, if you're seeking comfort and style on your whale watching tour, this is the tour for you. The Fanta Sea is also available for private charters for large groups. Tuesdays, Thursdays Fridays, Saturdays and Sundays. Meet at 9:30 AM for 10:00 AM Departure. This tour is available year round, but whales are only in season from approximately December through March. All ages welcome. Kids under 5 are free. This tour is available year round, but whales are only in season from December through March. If you don't want to get wet, you can stay on the boat and sun yourself or relax with a drink while the others are snorkeling.